A couple of weeks ago I promised to share with you photos from Little A's 6th birthday party, and I'm so happy to finally be able to do so! But first I have to say, I think this birthday marks the graduation of Little A's "Little" title. I know he's still technically just a little guy but I feel sort of odd calling him "Little A" here when I see just how much he's growing, learning and doing these days! It seriously blows me away. I think he just might simply be "A" now. Wow. It's a bit crazy for me but I feel it may be time. I remember when "Little O" shed his "Baby O" title and I was equally parts sadly nostalgic and eagerly excited for the future. Similar feelings accompany the shedding of A's "Little" title. And of course, as a collective, my "Littles" will probably always feel like my "Littles", and I'm sure I'll continue to refer to them as such (even when they are 18+...). So on to the birthday celebration. A and I had tossed around a number of birthday theme ideas for this years party. I was feeling a party for party's sake (not necessarily any theme at all) and he just kept coming back to Legos. 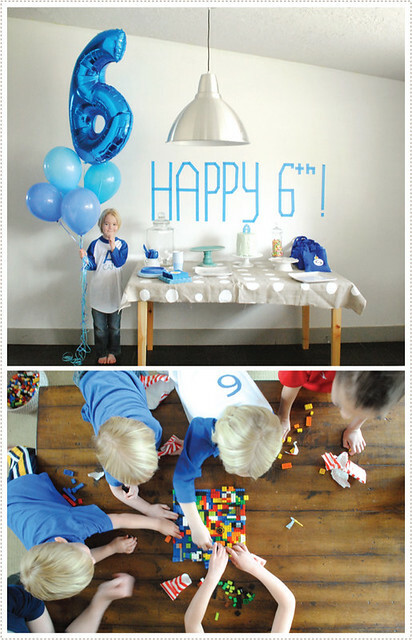 Six is a great year to delve into these little interlocking building blocks and so a Lego theme it was. I was over the moon excited about this but still wanted to keep things simple. I didn't want this to be an over-the-top, everything screams "Lego" party. 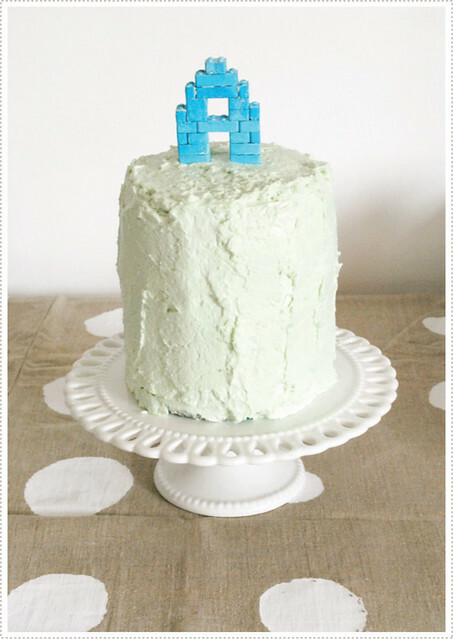 So we went with an overall blue color scheme with little bright pops of Lego, here and there (Such as the candy Lego "A" that Jon constructed atop of A's cake [which promptly fell flat on it's face and into the frosting after a bump to the table. But at least we got some photos of it before hand. 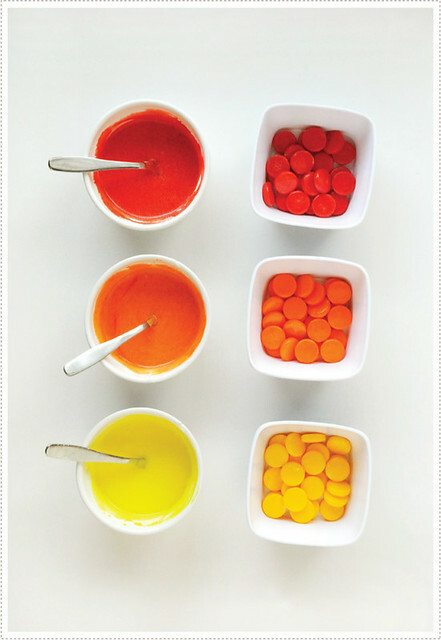 If you do this, I would suggest securing the candy Legos together with either frosting or melted sugar, etc. and then finding a way to actually stick it into the top of the cake). 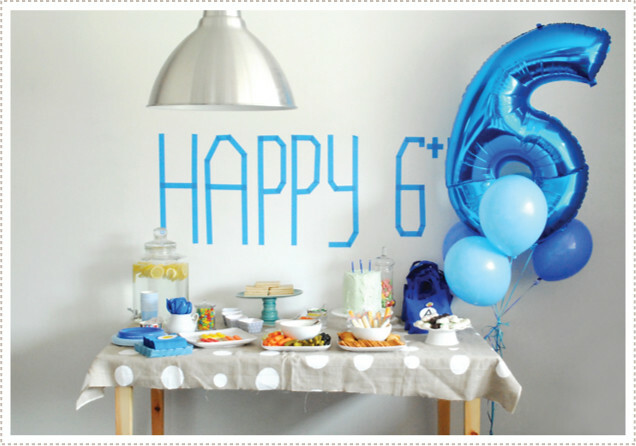 On the day of the party Jon surprised A by bringing him a bundle of balloons complete with a gigantic mylar "6". He was thrilled. And I taped out a "Happy 6th!" message (which he requested) with painters tape to the wall which he was very pleased with (in fact, he has since become obsessed with creating his own words and numbers with painters tape on the wall, and I'm quite impressed with his skill at doing so. I'll have to share these with you later). I also freezer paper stenciled "A CAT" (one of our nicknames for him) on the front of a baseball tee and then added a "6" on the back. When the guests arrived we had them gather around the living room table to engage in a bit of free-for-all Lego play. On their own they decided that they would collectively build "Lego City" and they had quite a fun time with it. In fact, I had to nudge them a bit to get them to move onto to other games, such as "Find the Little Lego Man" in the back yard. After games the little guests settled down a bit to frost and decorate their own individual Lego cookie. I used Angie Gubler's mom's recipe for the cream cheese-sugar cookies and brightly colored frosting. This is seriously the best cookie/frosting recipe I've ever tasted and it's very simple. After rolling out the dough, I simply cut out rectangles and popped them in the oven. And to create the little Lego "knobs", I purchased Spree candy, which worked incredibly well. ...and an even better time eating them! After the cookies were decorated, we gathered around to munch on snacks and goodies. And no birthday party is complete without the cutting and distributing of the cake. This year decided that I'd try to make the cake extra special (which was something A was really keen on). I toyed around with a couple of ideas and settled on a 6 layer blue ombre cake, with each layer celebrating a year of his life. (And with only one cake pan at the size I needed, well, I was celebrating each year until 3 AM the night/morning before his party). A and the other kids loved it and I was seriously happy that it actually all came together. I used this recipe for the cake. It was rather involved but still a fun endeavor (even if I did over whip the top frosting a bit). Perhaps I'll only do this once in their little lives, on their 6th birthday. Could be a fun tradition. 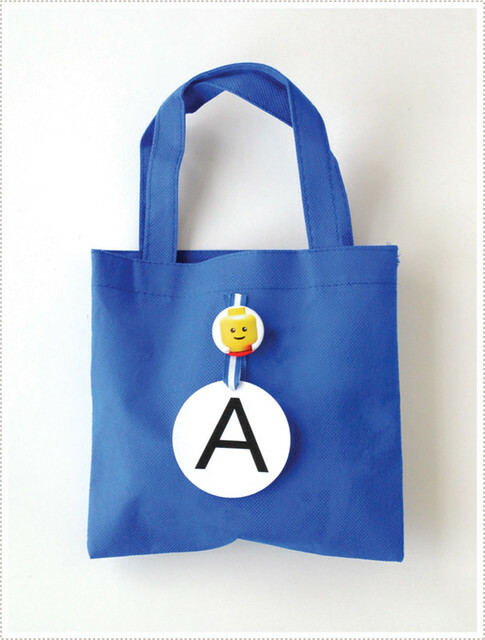 For the little guest gift bags, I made a Lego man button and pinned it to each bag, complete with their initial. I then stuffed the bags with several goodies such as a mystery Lego character in a bag, play dough, Lego stickers, a ring pop and Chinese handcuffs (my personal favorite. I played with A's the rest of the afternoon). The kids were also able to fill a few bags with jelly beans and Lego candy and take those home as well. A great time was had by all and A still talks about the party. In fact, he had a number of suggestions for what could be done for another Lego party in the future. Such as "Mom! what if we hung Legos on a string from the ceiling?!" Or, "What if you put the 'Happy Birthday' sign right outside my door, in the hallway, so that I could see it as soon as I woke up?!". Yes, I do believe the party planning gene has officially been passed on. Perhaps I just might let him do all the planning for his next birthday. Which is guaranteed to be Oh so far away. I made him promise me that. **Oh and don't forget to enter the Hand in Hand: Crafting with Kids book giveaway! End of day Wed., April 18th, is the last day to enter. And as a reminder, I'll be announcing the winner on Friday, so stay tuned! Find the Lego Man in the backyard???!!! I Want to Play! 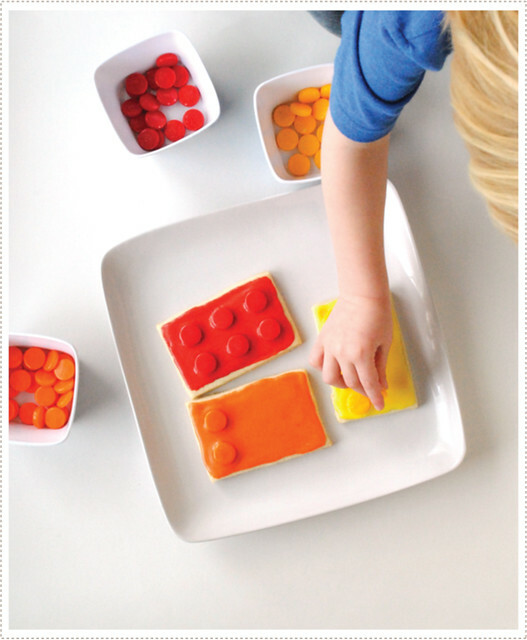 This looks like fun:-) Might have to have a lego party for myself! 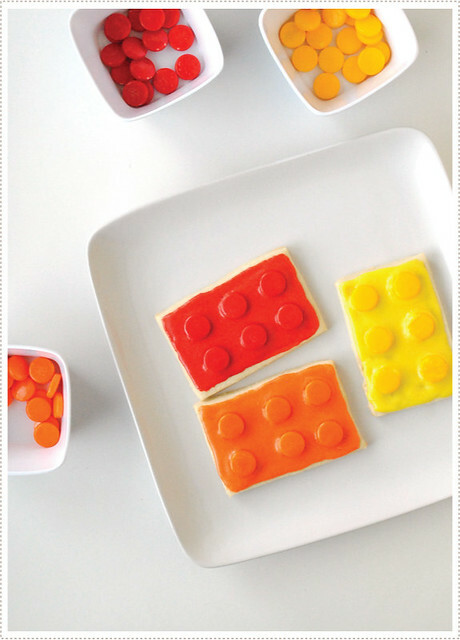 I love the idea of Lego bricks! Pretty! This is so lovely, im pretty partial the the happy 6th in painters tape. Great job! That cake is seriuosly impressive. This is great! My son is lego obsessed so I love the ideas here. The cookies are my favorite. Thanks for the inspiration! you are so creative, everything turned out so perfectly. i think i'm going to try and make a layered cake like that for virlie's birthday...i'm nervous! Oh Virlie will love it! And you will do fabulous. My one suggest is to get two pans at the size you want so that you can have two cakes cooking side by side in the oven. Would have saved me loads of time. The cookies are perfect! The hidden color cake is officially my go-to cake these days. 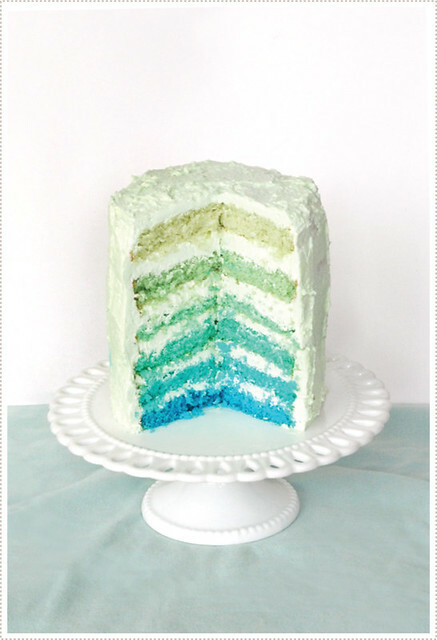 (I made a 4 layer blue ombre cake for my husband back in February (he paints large blue paintings so it seemed appropriate)) I cheat and use white cake mix and my husband ranted about how good the cake was - it's a real time saver when baking all the layers takes long enough! Oh soo very cute!! I love how he got what he wanted and so did you! Too bad ya'll aren't still in Knoxville! I've started a Lego Club and the children meet in the Children's Room once a month to brainstorm, build, look at Lego idea books...I bring a huge bin of random pieces and they get to keep their creations until the next meeting, when the creations are broken and poured back into the collective bin. 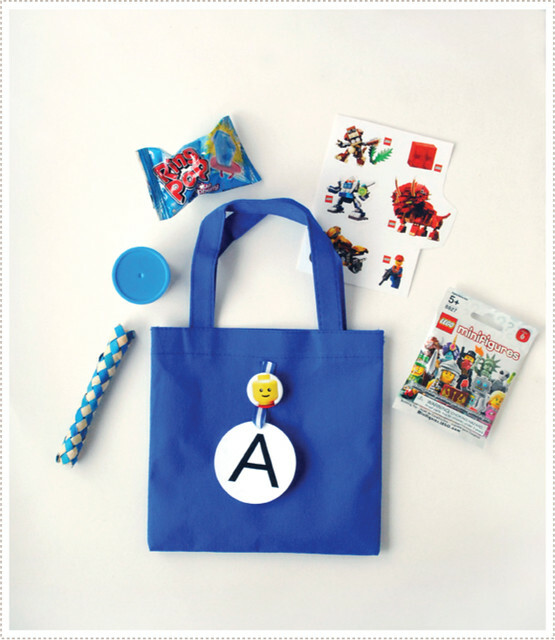 Hand in Hand:Crafting with Kids Winner!